The North Carolina High School Athletic Association, which traces its origin to 1913, is a voluntary nonprofit corporation that administers the state's interscholastic athletic program. Any public or nonboarding parochial high school in the state is eligible for membership, provided it is accredited by the state Department of Public Instruction and as long as the school adopts and maintains a prescribed code designed to guarantee wholesome athletic competition. Each of the more than 300 member schools has pledged to put the best interests of the student athletes above any other athletic purpose. In 1913 University of North Carolina librarian-professor Louis Round Wilson spearheaded the founding of a state high school athletic association as a part of the university's Extension Division, of which he was director. The first statewide high school athletic contest-a track meet at UNC on 11 Apr. 1913-was conducted by the Greater Council, a UNCstudent organization composed of the president of the student body, class presidents, and other student leaders. As a result of this track meet, the General Alumni Athletic Association of UNC, seeing the possibilities of conducting a statewide program of interscholastic high school athletics, appointed a committee on high school athletics (part of the Extension Division), which until 1924 exercised general supervision of the various championship contests. The athletic association, which has offices in Chapel Hill, recognizes athletic activities as an integral part of a child's educational experience. By uniting in a cooperative manner, member schools are better able to promote the growth of interscholastic athletics, to maintain a high and uniform standard for all high school sports activities, to enact as well as enforce rules and practices that afford equitable competition, and to protect the athletes from exploitation by special interests whose purpose is not educational in nature. Other services rendered by the organization include certifying the eligibility of more than 90,000 students in various sports; providing catastrophe insurance coverage for athletes, cheerleaders, managers, and coaches; maintaining financial records and distributing funds to the schools; investigating incidents of unsportsmanlike conduct and levying prescribed penalties as appropriate; recruiting, organizing, and training game officials; and working with the news media and the public to promote interscholastic athletics. Ernest M. Allen, "A Study of the North Carolina High School Athletic Association" (M.A. thesis, UNC-Chapel Hill, 1940). Facts about the North Carolina High School Athletic Association (1978). 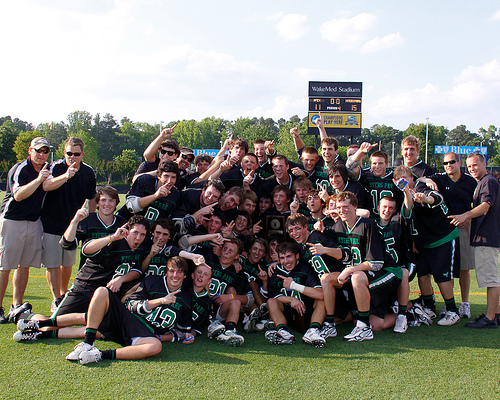 2010 NCHSAA Men's Lacrosse Championship, Apex vs Myers Park. Image courtesy of Flickr Creative Commons user KarlFisher. Available from http://www.flickr.com/photos/mrfishk/4622763933/ (accessed September 19, 2012).